Both of these different balls can be used to tighten and tone the abdominal muscles and core group to give you the muscle development you are looking for. However, to truly achieve six pack abs, you also need to peel off the subcutaneous fat that overlays those muscles so you can show them off. Unfortunately, some of us have a more difficult time peeling off the fat than others. So how well your six pack shows up will be a function of how well your body will burn fat and not a function of how well you do these exercises. These next exercises should be done with proper form to reduce the potential you’ll get injured. An injury can keep you from the gym and workout program for weeks, during which you’ll lose most of the muscle you’ve already developed. Proper form = less likelihood of injury. 1. Overhead toe touch: Lie on your back with your hands overhead. Keeping your legs together, raise them up over your hips so your body is forming an “L” shape. Now, bring the ball overhead, using your abdominal muscles and keeping your neck in a neutral position, reach your arms as close to your toes as possible. Crunch your upper body to the toes for 12 repetitions. If you have trouble keeping your neck in a neutral position, pick a spot on the ceiling and watch the ceiling. 2. Overhead Slam: This is fun, but shouldn’t be done with people on the floor below you. Standing with feet shoulder-width apart and your knees just slightly bent, hold the medicine ball overhead. Bend at the hips without arching the back and slam the ball on the ground directly in front of you. Control is key here. Repeat 12 times. 3. V-up: Lying flat on your back with your legs extended, reach your hands overhead holding the medicine ball in both hands. Engage your abdominal muscles to lift your hands and feet so your body forms a “V.” When you get to the top of the V pass the ball from hands to feet, squeezing the ball between your feet. Lower yourself back to the floor. Return to the V position and pass the ball back to your hands. Repeat 8 times. Using the swiss ball can help target those pesky lower abdominal muscles that are so important to sleek abs and a strong core. 1. Leg Raises: Lie on the floor, palms down and arms by your side. Bend your knees to 90 degrees and grasp the swiss ball between your ankles. Rais your feet up to 90 degree angle at the hip and lower. Repeat 10 – 12 times. 2. Knee Crunches: Lie on the ball in the plank position with your hands on the floor and your knees on the ball. 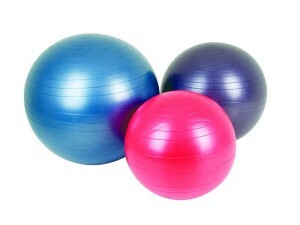 Pull your knees in to your abdomen and then roll the ball out again. Do this slowly and with good form to activate the lower rectus abdominis and not the hip flexors. 3. Using both a weighted ball and stability ball you can improve the strength and flexibility of your core. Lie face up on the stability ball with your back and head pressed against the ball. starting with the weighted ball against your chest, crunch up with your shoulders off the ball and reach the weighted ball to the ceiling. Return to the starting position. Repeat 10 times. 4. The Plank: Doing the plank on the ground works your back and abs, but doing it on the swiss ball also activates your obliques as your body works to stabilize the ball in the plank position. With your elbows on the ball, move your body into the classic push up position. Keep your abs and glutes tight. Hold this until you can keep good form any longer. Repeat 3 times. → Too Busy To Eat Healthy?